Portugal offers many surprises, all packed into a small country. Whether your interests are in ancient attractions, medieval villages, seaside towns, castles, agrotourism, mountains, beaches or cultural treasures, Portugal is a destination you won't want to miss. 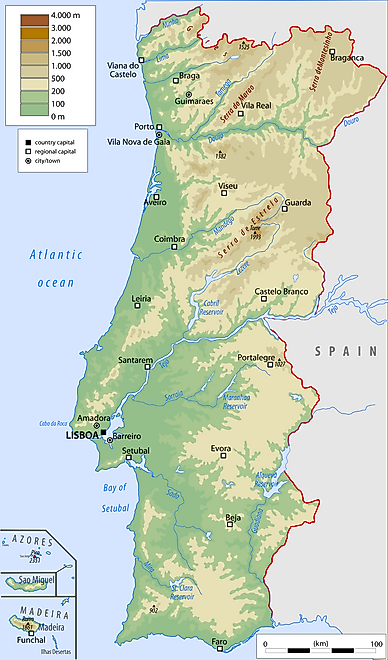 The best time to travel to Portugal is either from March to May or September to October. During this time, the weather is warm but mild enough that it doesn’t get uncomfortable. Seven days in Portugal offers plenty of time to take in the activities of the country’s most famed cities, Lisbon and Porto. To enrich the experience, a day trip to the gorgeous town of Sintra can also be added. Rail travel between all three of these cities is quick and plentiful, not to mention full of beautiful views. No trip to Porto is complete without a visit to its medieval old city, called Ribeira. For wine lovers, the Porto Wine Cellars are also an absolute must-see. In Lisbon, the energetic atmosphere of one of Europe’s most cosmopolitan cities is infectious. Making the journey to the top of the Crsto Rei, the city’s most famous statue, will reward you in stunning vistas that must be seen to be believed. Sintra is most famous for its gorgeous 19th century architecture that is a UNESCO World Heritage Site. It is a great city for photo opportunities, and is a popular layover location for trips between Porto and Libson because of its geography. After a few days in Porto, this itinerary encourages you to take the train to the historic city of Coimbra, a journey that takes just under an hour by high-speed rail. Coimbra was formerly the capital of Portugal from 1131 to 1255. Today, it is popular amongst travelers for its quaint old city that can easily be explored on foot over the course of one day. From Coimbra, the train will connect you to the Portuguese capital of Lisbon. Lisbon is jam-packed with activities and can warrant a stop of at least a few days. If desired, a day trip to Sintra is also doable in this itinerary. A visit to Evora rounds out the end of the trip to Portugal. Evora is a UNESCO World Heritage Site, mostly thanks to its medieval-era walls and well-preserved monuments, among them a Roman Temple. Aside from this, Evora is a liveable city and a very pleasant place to spend a day or two.